“I have been busy since I last shared my progress. I am now five months post stoma surgery and feeling wonderful. My new employment is fitting in brilliant with my life and I have so much time to enjoy my running events and social time. 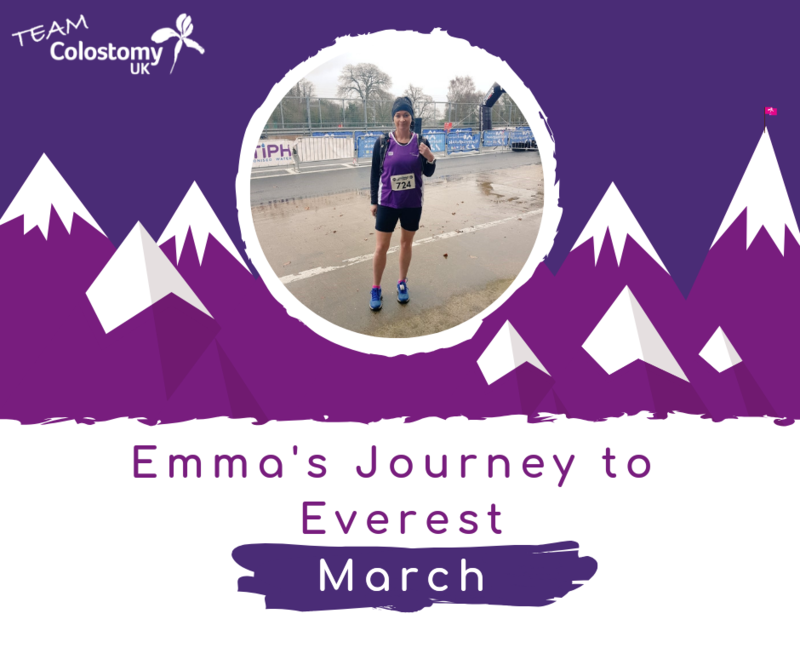 I have been upping my training in preparation for Everest and have run the Tatton Park 10k, Outlon Park Half Marathon and Wrexham Half Marathon. I even achieved a personal best in one of the half marathons and took 45 minutes off from last year, showing just how much of a difference fighting an illness can make. This has just been an unreal achievement for me and I think when you are seriously sick it focuses you to re-evaluate what is important to you. Everest has been a dream of mine since I was a teenager and now I want to work hard to accomplish this. I am now trying to adapt my life to fit in training three times a week and I have recently started back at the gym too. My next event now is my marathon on the 26th May in Liverpool. Go slowly, and when I mean slowly, I really do mean slowly, too many people try to walk at normal pace and quickly suffer from acute mountain sickness. You’ll probably get a headache, most do, but going slowly will help fend off the serious mountain sickness. Drink a lot of water, you’ll probably lose your appetite as you climb higher, so it’s very easy to drink less and eat less. You need to really try hard and drink two to three litres on your days’ trek. It’s going to be cold in the mornings and evenings, one of the best pieces of kit is a light weight down jacket/belay jacket. They keep you warm but are super light. You can pick them up in Kathmandu for a very cheap price. When you get to the tea house, change out of your trekking gear straight away into something dry and warm. I see way too many people simply going into the communal area to try and get warm near the fire. Resist this urge, change into dry gear then go and warm yourself by the fire. Cleanliness is key. Take medical wet wipes. Yaks are all over the trail and it’s easy to pick up bugs. Keeping yourself clean is essential. You’re probably already onto this, but test all your kit before you leave. You’ll have a weight limit on the flight to Lukkla. I can’t recall what it is but 10 kg is ringing a bell. This means you need to work out what you need and what you don’t. It’s best to check this before leaving. You can however wear as much kit as you want above the 10 kg, so you’ll see climbers in their climbing boots, big jackets etc. If you forget anything, don’t worry. You can get anything very cheap in Kathmandu, from kit to medication. Thanks very much to Dominic for his words of wisdom, we will bring you more updates as they come!